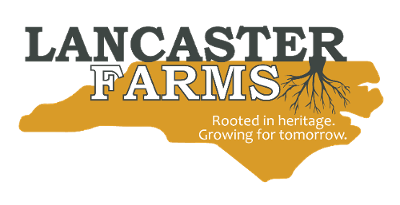 Lancaster Farms in Wilson, North Carolina, produces delicious sweet potatoes that are one of the most nutritious vegetables produced anywhere in the world. 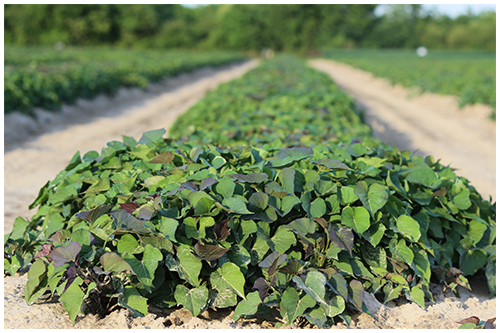 The climate, soils, and growing season make eastern North Carolina the ideal place for sweet potato production. Early settlers discovered the sweet potato upon their arrival in the New World in the 15th century. At first, the Europeans thought they had found the yam they knew in Europe, but soon discovered the sweet potato, native to the Americas, was easier to grow, better tasting, and easy to produce in what would become the southeastern U.S.
Sweet potatoes begin as sprouts from selected potatoes arranged in growing beds. These beds are planted in late March, nurtured, and cared for until the sprouts can be clipped for planting in mid to late May. The potatoes require a growing season of 90 to 112 days. This is not a "plant and forget" crop, but one that requires expertise. Experience and keen observation help determine the correct schedule. To insure the production of the healthiest and most nutritious potatoes, the fields must be kept clear of weeds and insects. Tight controls are necessary on fertilization, insects, and water. 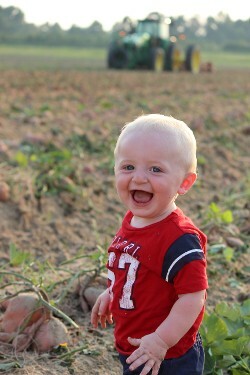 More so than with some other crops, potatoes require constant observation and cultivation during the three- to four-month growing season. As with each step in bringing the finest sweet potatoes to your table, the harvest is one of the most important. Our labor force has to be trained in grading the potatoes into the different sizes and qualities. This is one of the reasons we strive to retain the trained, experienced labor force year after year. Once the potatoes are harvested from the fields, the process of curing them to perfection to bring out and establish the sugars and other nutrients begins. Our potatoes are stored and cured in specially designed and constructed curing and storage facilities. Our facilities are the most modern and up-to-date. Both the curing and storing procedures are equally important. Once the potatoes are cured, they must be stored and stabilized at certain temperatures to maintain the quality and the nutritional content of each potato.